Nothing worked if you subscribe to a definition that some returns should be positive. There was diversification benefit, but it was just to smooth losses not offset. 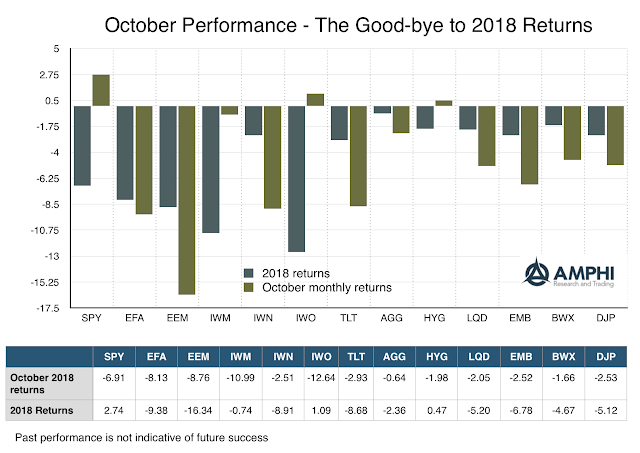 Even a diversified 60/40 SPY/AGG portfolio would have lost more approximately 450 bps for the month. The stock/bond correlation is changing from its usual strong negative post Financial Crisis relationship. That said, there was over a 600 bps differential between the SPY and AGG ETFs. The difference between a 60/40 versus 40/60 stock/bond allocation would have meant a 120 bps return gain. This is not trivial in a low expected risk premia environment. On a micro level, reported earnings beat estimates albeit guidance for the fourth quarter is a little more lukewarm. The macro environment is not perfect, but there was little by way of a single catalyst that would have caused a market sell-off. Growth is good albeit forward indicators are more suspect domestically. International growth is being revised downward and should be a concern. Price trends have turned down which certainly triggered more selling, but if you were looking for a first cause, there were few signs. Stocks do not seem to be overvalued. Many are near 52-week lows. Volatility is higher but we are already seeing a usual pattern of decay. The causes for the decline now seem obvious. We can point to the usual suspects, trade wars, geopolitics, raising rates, fiscal deficits, and some economic slowdown. At least, this is what everyone is saying. This is what investors often do - generate their opinions which are related to biases like hindsight. In hindsight, we all knew this month was coming, but of course we missed it.